NASA’s Kepler space telescope has found an Earth-sized exoplanet in the habitable zone of its parent star. The planet, designated Kepler-186f, is about 500 light years distant and is the first such exoplanet discovered, raising hopes that Earth-size planets are relatively common in the universe. As discussed in our Astrobiology FAQ, the ‘habitable zone’ is the orbital distance from a star at which any water found on a planet surface would remain liquid. 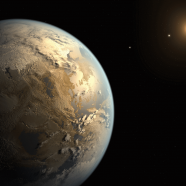 Other exoplanets have been found in their respective habitable zones before this discovery, however this is the first time one a similar size to the Earth has been detected. The mass and composition of Kepler-186f is still unknown, however previous studies would suggest it is a rocky planet.